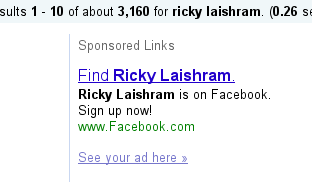 In a bid to increase its presence in India, Facebook has started using India specific Google ads. These ads appears when you use www.google.co.in to search for someone from India who is Facebook. These ads do not appear when you search for someone who is not in India or from another local Google search other than Google India. This kind of promotion can change the fortunes of Facebook in India, which is one of the few countries where Orkut is still very popular. Has Facebook started such kind of ads in any other countries? Let us know.